Jan 3rd, 2016 - written by Kimserey with . F# + WebSharper is an awesome combination to build web application. The only problem is that if you want to build a webapp larger than a to-do list, it’s hard to find examples to use as references. It is even harder to find tutorials that touches on overall design and answer questions like: How should I start? Where should I put the code? How should I separate the code, put it in different files, with different namespaces or modules? How many layers? The idea of a modular achitecture is that the application is composed by small pieces (modules) which are completely independent from each other. One lives without knowing the others and none of the modules have dependencies on other modules. The patterns explained in the blog post of Addy Osmani goes much deeper and defines many other patterns but to me the most crucial understanding is that we should strive to manage dependencies. Coupling is the worst enemy of large applications. It stops us from changing or removing pieces of the application and brings FUD in our daily development. I’ve been there.. and it’s most certainly not fun. Following this rule enables us flexibility. We will then be able to easily remove or add pages. 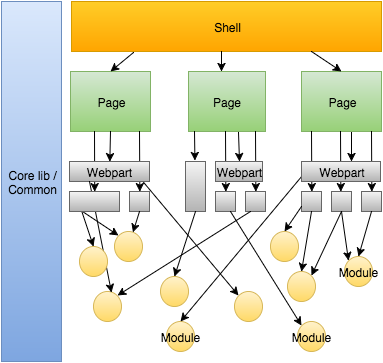 We can also substitute a module for another in a webpart or substitute a webpart for another in a page without issues as they are independent from each other. If you aren’t familiar with WebSharper.UI.Next html notation, I have wrote a previous blog post where I gave some explanations about the UI.Next.Html notation and how to use the reactive model Var/View of UI.Next. F# allows us to ensure the references are one way only. Only bottom files can reference top files, your functions must be defined first before you can use it. Therefore, if we keep the modules at the top level, it will indirectly make the modules the code with the least dependencies in the project. We then write the code to compose the shell and the navbar. The links in the navbar will be constructed based on what is defined in the pages. If the page is accessible through nav, it will create a button link in the nav. Then the display option is used to define whether the page will be full screen or embedded with nav at the top. Each page is defined as a sitelet using the route and title and then sum together to form the main sitelet. Client contains the code which will be converted to JS. Static contains the code that is used by the Sitelet to compose the page. In other modules, there will be one more module called Server which will contain the WebSharper RPC calls. As expected, they define the title, route, content of the page and how it should be displayed and accessed. panel is a helper defined in the Bootstrap module in Common. I won’t explain it but you can find it in the code. To get the weather, I used http://openweathermap.org/api. Using the JsonProvider from FSharp.Data simplifies the interaction with the open weather api. We then provide a RPC call which returns the Forecast depending on the city given. RPC allows Server calls to be called from Client code. Serialization is handled automatically by WebSharper and we can use the same types that is returned from the Server in the Client. We then construct a reactive doc based on the city given. Everytime the city changes, the RPC is called and the doc is updated. View.MapAsync: ('A -> Async<'B>) -> View<'A> -> View<'B> takes as first argument an async function which is ran every time the view is updated and returns a view of the result of the async function. Today, we have seen one way of structuring a web app which allows us to reduce coupling between elements and allows rapid changes and adding new features easily. We have built a shell which doesn’t need to be touched anymore and automatically add links to its menu based on the pages that we register. Finally this structure also allows us and other developers to not be confused about where to place code and defined a clear way for components to interact with each other. I hope you enjoyed reading this post as much I enjoyed writing it. As usual, if you have any questions, you can hit me on twitter @Kimserey_Lam. Thanks for reading!